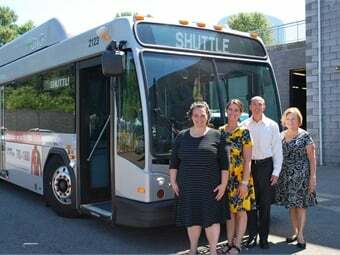 (Left to Right) Kristi McLaughlin, ESPAC Consultant, Owner McLaughlin & McLaughlin LLC; Kelsey Calder, GRTC Travel Training Instructor; David Green GRTC CEO; and Roberta Yegidis, Center for Urban Transportation Research at an event honoring Calder's acheivement. Richmond Va.-based GRTC’s Travel Trainer Kelsey Calder is now the first-ever nationally certified Travel Training Instructor. Calder successfully completed the Travel Training Certification program, becoming the first Travel Training Instructor to be awarded this prestigious certificate by Easterseals. GRTC’s Travel Training Program is funded by a Federal 5310 grant. Calder was already a licensed teacher prior to joining GRTC in 2016, holding a Master’s in Teaching from James Madison University with a concentration in Special Education. During GRTC’s pilot Travel Training Program, Calder completed substantial course work and passed her final practicum in June 2018. The Travel Training Certification program operates through the Center for Urban Transportation Research at the University of South Florida. GRTC is currently in the third year of its Travel Training Program; this service is open to all GRTC customers who desire assistance learning how to ride. Refugees to America located in Greater Richmond are increasingly benefitting from Travel Training. The primary goal, however, remains to provide current CARE customers the opportunity to learn skills that will enable them to follow a regular GRTC bus route. Travel Training Instructors create individualized travel plans that aim to meet the customer’s transit goals and show them how to use fixed-route transportation to increase transit options and decrease dependence on paratransit services. Participants in the program have one-on-one and/or group travel training with a Travel Training Instructor. Travel training is free and any participant is still able to use the CARE service. As always, all CARE customers may ride local fixed route bus service for free. Easterseals’ Travel Training Certification program teaches instructors essential, practically-relevant skills, including: performing a successful trainee assessment, customized trip planning, environmental barrier examination, task analysis, training strategies, street crossing skills, boarding/alighting processes, and compliance with the Americans with Disabilities Act.